While some agriculture sectors look for market access relief in NAFTA renegotiations, the U.S. pork industry has enjoyed duty-free access to Canada and Mexico. The Trump administration recently notified Congress of its intent to renegotiate the North American Free Trade Agreement. While some U.S. agricultural sectors face market access barriers in Mexico and Canada that they hope to overcome through these negotiations, this is not the case for the U.S. pork industry, which enjoys duty-free access to both markets under NAFTA. U.S. Meat Export Federation Economist Erin Borror points out that these favorable access conditions have been one of the primary factors in the growth of U.S. pork exports to both countries — especially Mexico. Last year Mexico accounted for 32% of U.S. pork export volume, with exports to Mexico equating to 8% of total U.S. pork production. Mexico is the largest volume destination for U.S. pork and ranks second to Japan in export value. Canada ranks fourth in both volume and value, accounting for about 9% of total U.S. exports. Borror notes that Mexico is an especially critical destination for U.S. hams, with strong demand from Mexico bolstering ham prices even in this time of record-large production. Mexico is also the second-largest market for pork variety meat (behind China/Hong Kong), accounting for 27% of all variety meat exports last year. U.S. exports to Mexico are coming off a fifth consecutive volume record in 2016, when exports reached 730,316 metric tons valued at $1.36 billion, and the market’s strong performance has continued in 2017. The United States holds about 85% of the imported pork market in Mexico, with Canada as the other main supplier. The success story in Mexico is all about growing consumer demand for affordable protein. U.S. pork has helped boost Mexico’s per capita pork consumption, which has increased from about 9 kilograms in 2007 to more than 12 kilograms in 2016 (consumption figures are in product weight). Over the same period, U.S. pork exports to Mexico more than doubled. Since 1993, the year before NAFTA was implemented, U.S. pork exports to Mexico have increased more than seven-fold, from just 95,000 mt to more than 730,000 mt. At the same time, USDA estimates that Mexico’s pork production has also grown by 58%. Mexico’s pork exports, which were basically non-existent in the early 1990s, set a new record last year at 111,257 mt, and were mainly to Japan, South Korea, the United States and Canada. NAFTA not only provided Mexican consumers with affordable U.S. pork, but it has also helped to strengthen the Mexican industry and encouraged Mexico’s producers to focus on their comparative advantages, including producing value-added products for Japan and Korea. Canada imports a wide range of pork cuts from the United States, both for further processing and for sale in its retail and foodservice sectors. Last year U.S. exports to Canada reached 205,372 mt valued at nearly $800 million. U.S. pork typically accounts for about 90% of Canada’s total imports, although the United States has recently faced increasing competition from European pork. Similar to the United States, Canada’s import duties on pork are basically zero, so its frozen pork imports from Europe are subject to zero duties. Europe has been able to fill some demand in both Canada and the United States for seasonally high-priced cuts such as ribs and bellies. It is important to note that Canada is by far the top market for U.S. processed meat exports. Last year processed meat exports to Canada totaled $778 million, which accounted for 50% of all U.S. exports. Mexico is with the second-largest market at $252 million, followed by Japan. For processed pork specifically (dried/cured/salted as well as cooked/prepared, and sausages), exports to Canada have increased from about $40 million in 1994 to $588 million in 2016, with export value more than doubling since 2010. Although Canada has zero duties on chilled/frozen pork imports, its World Trade Organization-agreed tariff rates, which are applied to non-free trade agreement countries, range from 9.5% to 12.5% for prepared pork products. So NAFTA has provided a clear advantage for high-value U.S. pork exports and helped cement Canada as the leading destination for these value-added products. 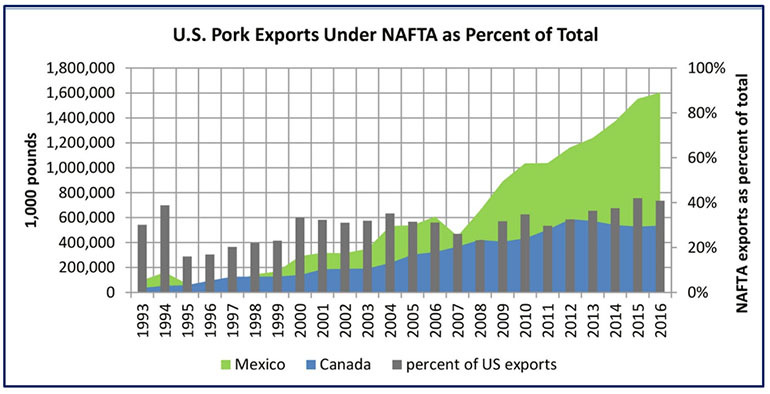 Imports of Canadian feeder pigs under NAFTA have also helped expand pork production in the United States. Canada previously shipped mostly slaughter-ready hogs to U.S. packers but as NAFTA was fully implemented, the largest growth in trade has been in feeder pigs. Thad Lively, USMEF senior vice president for trade access, notes that the one area of NAFTA affecting pork trade that could use improvement is its chapter on sanitary and phytosanitary measures. He says a strong SPS chapter was included in the Trans-Pacific Partnership, a 12-nation regional trade agreement that was to include the United States, Canada and Mexico. Although the United States withdrew from the TPP earlier this year, renegotiating NAFTA creates an opportunity to strengthen the agreement’s SPS provisions by incorporating parts of the SPS chapter that was included in the TPP.